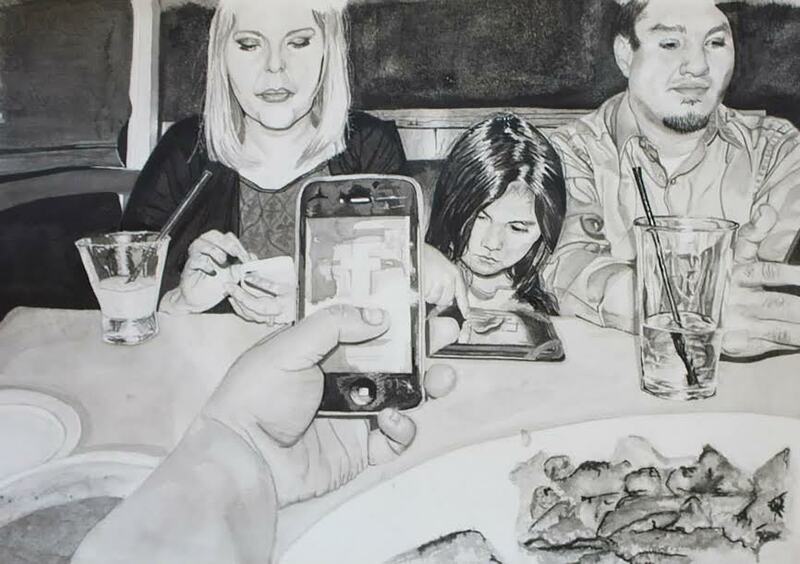 Katie Price’s piece detailing family members seated at a dining table with their cell phones out while not communicating with each other, one of the main ironies of American society in Price’s “Food for Thought” series. FORREST MILBURN Star Local Media Contributor When Collin College student at the Preston Ridge campus Katie Price’s art professor first gave her an artwork series assignment, Price didn’t take long to figure out which direction she should take. She remembered back before the semester had even started when she saw a photo of a group of Muslim women wearing hijabs on an American bus that displayed an enormous Victoria’s Secret ad on its side. This culture clash – and other ironies she noticed in American society – intrigued her, and she began to think about how Americans look at other cultures. Once the subject that united all of the ironies and inspirations became clear, she was ready. “I saw a photo on my cousin’s instagram she had taken on the Fourth of July. It was a picture of her little flag she had bought, and on the handle it had the words ‘Made In China’ written across it,” said Price, a secondyear art student at Collin College. “The idea of doing a series that >> FYI KIM DIGGS kdiggs@star localmedia.com ‘ISN’T IT IRONIC?’ Collin College students’ art featured at The Gallery 8680 “I love that a gallery that’s unaffiliated with the college does an annual student show for us. It gives students an opportunity to get their work seen and be a part of the gallery experience.” — KATIE PRICE, COLLIN COLLEGE ART STUDENT INFO BOX To read more about the Feehans and their church, visit their website at truenorthchurch frisco.com. See GALLERY, Page 13AExhibition features works from Collin College student artists pointed out other flaws in American culture seemed inevitable.” Price, as well as some other students in her Drawing II class, got the chance to see one of her series’ pieces displayed at the reception of The Gallery 8680’s sixth annual “Students at Work” show Friday featuring artwork from Collin College students. The gallery, run by creative director Robyn Parker Feehan, is located in downtown Frisco as an extension of True North Church, where both Robyn and her husband, Glenn, copastor. “There has been much progression for the arts in Frisco. Frisco has the capacity to draw artists of music yet still is trying to establish itself to the artist who has a pictorial talent, a talent that speaks with paint and passion,” said Robyn. “The intention is to draw the attention toward the arts, the artists and the voice, which they have.” When working on her series “Food for Thought,” Price realized that she wouldn’t be able to get all of her pieces ready in time, in the condition she needed, before the opening reception. Some of her pieces required Price to start all over because of the techniques involved and the sizes of the artwork themselves. The only piece from her series that is displayed at the gallery is one featuring a family eating dinner while all are on their cellular devices. The irony of how technology is supposed to bring people together, according to Price, while also distinctly keeping us apart, is why Price chose to feature that situation in her piece. “The only one of my pieces from the series will be the ink wash one. It’s kind of like watercolor but with ink, where you dilute it with water to get different tones,” Price said. “I actually had to do it about three times before I got it right. I had to use razor blades to erase since you can’t erase ink, and I would actually poke holes through the paper.” The chance to excel in her college Drawing II course might have been sufficient enough, but for Price, the gallery itself holds a special place in her heart. “Two years ago, I had my first show here. The owners are amazing, beautiful people and I’m honored that they continue to let me display my work,” Price said. 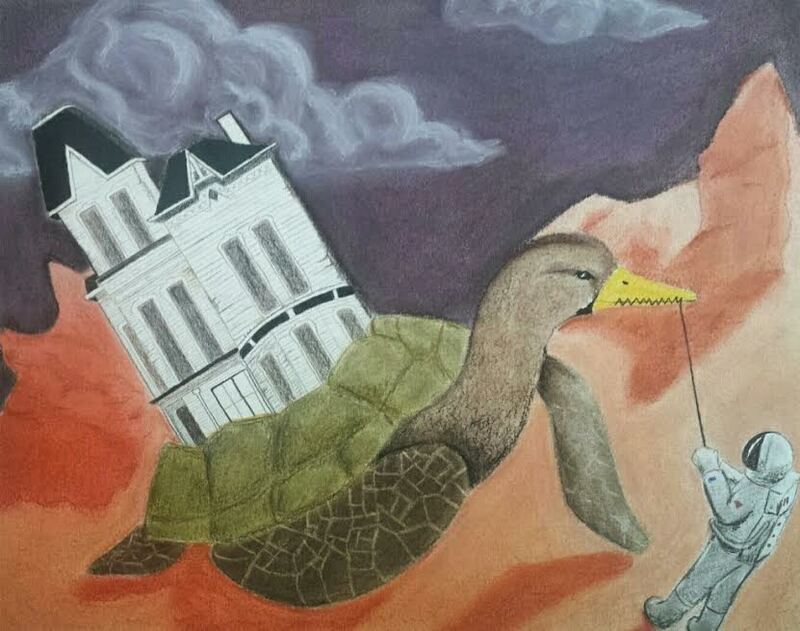 “I love that a gallery that’s unaffiliated with the college does an annual student show for us. 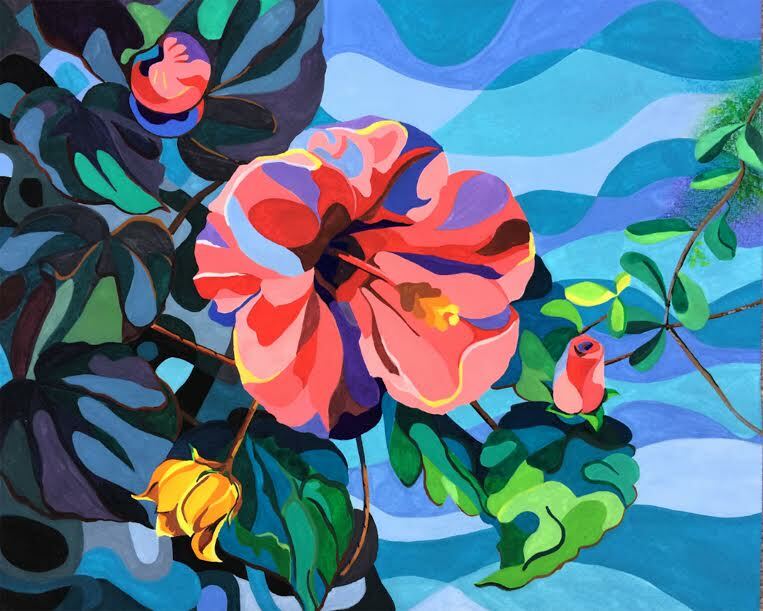 It gives students an opportunity to get their work seen and be a part of the gallery experience.” Once Price gets her associates at Collin College, she plans on transferring to the University of North Texas to get a bachelor’s degree in fine arts and later a teaching certificate. For Price’s Drawing II professor Eilene Carver, who was at the reception, Price’s career as an artist and teacher has just begun. “Katie is one of the more creatively driven individuals I have ever taught,” Carver said. “She never settles for [mediocrity]. Numerous times she has started a project over simply because...she knew she could do even better if she started over.” Price’s artwork can be seen at the gallery every Wednesday through Friday from 4 to 6 p.m. along with the artwork of fellow students Maleka Riaz, Natalie Tuggle and Jamie Golata. The gallery’s closing reception is on June 28 from 2 to 4 p.m.